Spinoza argued that God exists and is abstract and impersonal. His view of God is what Charles Hartshorne describes as Classical Pantheism. 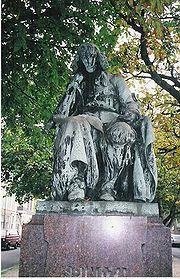 Spinoza has also been described as an "Epicurean materialist," specifically in reference to his opposition to Cartesian mind-body dualism. This view was held by Epicureans before him, as they believed that atoms with their probabilistic paths were the only substance that existed fundamentally. 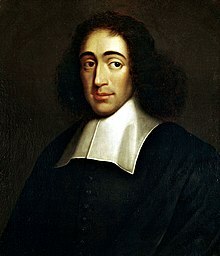 Spinoza, however, deviated significantly from Epicureans by adhering to strict determinism, much like the Stoics before him, in contrast to the Epicurean belief in the probabilistic path of atoms, which is more in line with contemporary thought on quantum mechanics. 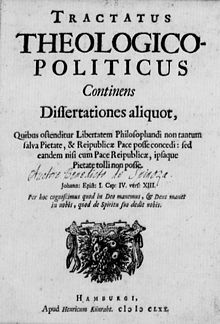 Spinoza's system imparted order and unity to the tradition of radical thought, offering powerful weapons for prevailing against "received authority." He contended that everything that exists in Nature (i.e., everything in the Universe) is one Reality (substance) and there is only one set of rules governing the whole of the reality that surrounds us and of which we are part. 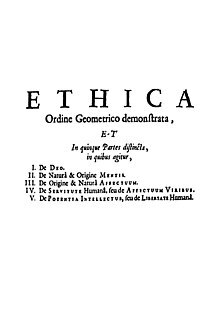 Spinoza viewed God and Nature as two names for the same reality, namely a single, fundamental substance (meaning "that which stands beneath" rather than "matter") that is the basis of the universe and of which all lesser "entities" are actually modes or modifications, that all things are determined by Nature to exist and cause effects, and that the complex chain of cause-and-effect is understood only in part. His identification of God with nature was more fully explained in his posthumously published Ethics. Spinoza's main contention with Cartesian mind–body dualism was that, if mind and body were truly distinct, then it is not clear how they can coordinate in any manner. Humans presume themselves to have free will, he argues, which is a result of their awareness of appetites that affect their minds, while being unable to understand the reasons why they desire what they desire and act as they do.